Dame’s is where crispy, Southern fried perfection meets deliciously sweet European decadence. Dame’s pairings are world-class, comfort food combinations meant to fulfill your appetite’s and heart’s desires. 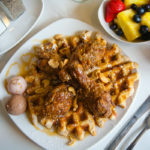 From “first-timers” to “barnyard veterans”, Dame’s Almost World Famous Chicken & Waffle inspirations are truly palette pleasing pairings that offer something special for all comers. We hope you enjoy every morsel.